Delegates from various Muslim countries are calling for a worldwide supreme board or council to coordinate and standardise halal certification for Islam-safe products, saying the various different regulations across different countries would be counterproductive and confusing to an overall global halal market. 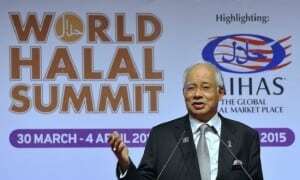 He said this is an issue that all nations, Muslim nations predominantly, can gather around and solve. “There maybe many disagreements among Muslim countries on different issues but I believe that there should be no disagreements on halal products among Muslim countries. “I believe that there is sufficient infrastructure to form a supreme council to coordinate this issue. I believe that no country should say ‘The rules I’m applying at a national level are the best’. United Arab Emirates Minister of Environment and Water, Dr Rashid Ahmed Mohamed Fahad said: “The halal industry is quickly becoming a global aspect and is attracting many non-Muslim consumers because of its guaranteed safety and quality. Malaysia’s International Trade and Industry Minister Datuk Seri Mustapa Mohamed added: “We are in need for closer international collaboration and also to improve the perception of hlal certification. Mustapa noted that while the various nations continue to talk about the potential of the halal market, there is still a big gap between the demand and supply. “A study on our side has shown that the demand is so huge that currently we are now only meeting 20% of the demand for halal products in terms of the food sector. Thailand’s Deputy Minister of Commerce Apiradi Tantraporn said: “Nearly two-thirds of the Muslim population live in Asia and it is predicted that the world Muslim population would grow twice as fast as the non-Muslims in the next 20 years.